As a child, I was always fascinated by my neighbours roadside drumstick tree plantation. They gave us drumstick flowers, which mummy made into a yummy dry sabji for summer lunch. The fruit, one of its kind was long, thin and soft, when young, and firm, sticklike when mature. My fascination was more so because my neighbours did none of the fussing I did over my vegetable beds. They simply planted a meter long branch chopped from one of the older trees, covered the upper end with cow dung to prevent drying out, and watered it just occasionally. Their harvest never failed! 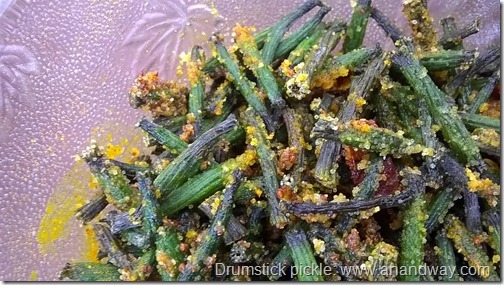 Drumstick, Sehjan or Singhi as it is better known in India is a super vegetable, rich in minerals especially Calcium. It is commonly found in Ayurvedic bone care medicines. 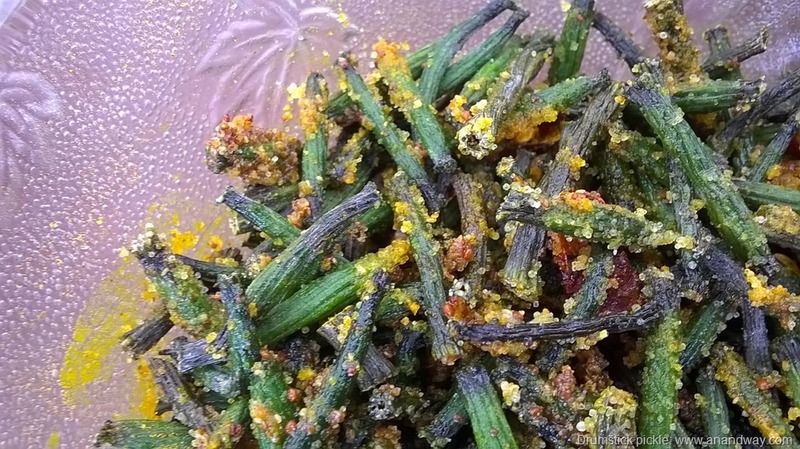 Once upon a time this food item was a regular ingredient in daily cooking, especially in sambhar in South India, and sabji and pickles in North India. For pickles, the vegetable is picked when young and soft. For sambhar, the mature sticks work better. Today, I made drumstick pickle, and it is now cooking in the sun! This is a long-standing Indian Ayurvedic recipe for strong bones and tasty food :) It is Ayurvedic, Vegan, no-flame cooking, and safe as a kids’ cooking project. Young, soft drumsticks: 10, washed, dried and cut into one inch pieces. Mix all ingredients and put in a glass bottle with a tight lid. Let sit in the sun for 5 days. Shake the bottle once a day to mix the juices well and let the sunlight work on it. Store in the kitchen at room temperature and serve with meals.